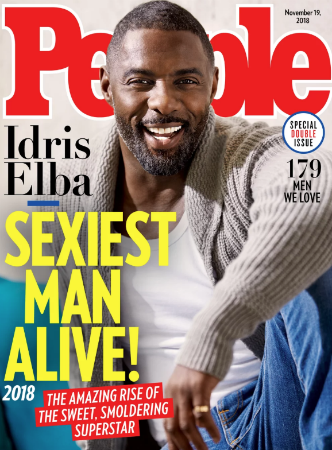 –Idris Elba has been named People’s Sexiest Man Alive. I was bracing for Bradley Cooper so this is a pleasant surprise — and a nice recovery from last year’s Blake Shelton disaster. -Celebs got into the voting spirit today — most notably Beyonce is repping for Beto and Taylor Swift made a rare Instagram appearance urging people to the polls. –Brad Pitt and Angelina Jolie‘s custody court date has been set for Dec 4, so watch for them to spend the next month subtly shading each other in the press. –John Stamos needs to learn that not all stories should be told out loud. –Meghan Markle‘s family drama reportedly helped bring her even closer to Prince Charles, so at least something good came out of that mess. –Danai Gurira, Norman Reedus and Melissa McBride are currently negotiating “groundbreaking multiple-year ‘franchise/universe’ deals” that mean if their characters get written off or moved to another Walking Dead property, they’ll still get paid. It also looks like Gurira will take over as the lead of the show, which makes way more sense than Reedus (unless everything’s changed since I last watched and his character says more than 4 words in every episode). –Ariana Grande‘s exes seem ok with her mentioning them in her breakup song. Pete Davidson reportedly didn’t get an advanced listen, but as soon as he heard it he asked Lorne Michael’s permission to address their relationship on SNL. -It took way, way too long, but Rebel Wilson has finally apologized for her comments and for blocking people who called her out on it. -Here’s a clip from Shoplifters — one of the best movies I’ve seen this year. –Matthew Rhys and Jamie Dornan star in the trailer for the new BBC show Death in Nightingales. Please, somebody air this here! -5 become 4: The Spice Girls (minus Victoria Beckham) announced today they are reuniting for a UK tour. Beckham wished her former bandmates well on Instagram— while making it clear she wouldn’t be joining them. -Meanwhile, Andrew Lincoln is still bitter about the way the show treated Steven Yeun. –Rihanna wasn’t happy to learn that Trump was using her song at his rallies. -This is good news: Demi Lovato was spotted in LA post-rehab looking happy and healthy. –Kenan Thompson wasn’t happy with Pete Davidson’s joke about Dan Crenshaw during this weekend’s SNL. -Meanwhile, I’m not sure about Davidson’s speech about Ariana Grande at the end of his Weekend Update segment. I’ll probably appreciate it more once I’m convinced he’ll stop making jokes about their relationship. -Man, Rebel Wilson is mis-handling this thing in every way possible. Instead of just eating some humble pie and saying she misspoke, she is blocking black critics of her comments. -No cast on TV is currently having as much fun as Legends of Tomorrow’s and you’ll never convince me otherwise. -I don’t know why I’m surprised that Lindsay Lohan showed up at the EMAs last night, but I am. -Broad City creator Abbi Jacobson talked about the time she had to explain to a guest actor why his “compliment” to Ilana Glazer about her body was not OK.
-I don’t get why everyone freaked out about this Britney Spears IG post and she deleted it? It looks just like a million other posts on my feed about people messing with Snap filters. -Is there anything the world needs less than a movie from The Chainsmokers? -You’re The Worst just got a premiere date and trailer. Yay! I kind of forgot this show exists but I’m totally here for its final season.